TOP NAV reset map list all ?? I80 is never going to be the first choice to cross the Wasatch Range on a bicycle. But with so many other options available, Parley's Summit is always a possibility to return quickly to the starting point on the other side of the mountains. This is not a quiet or great smelling ride. But it is safer than many small country roads, that in reality are overloaded expressways without a shoulder. 02. (4950ft,m04) junction: 3300 south, Wasatch Blvd. From West. 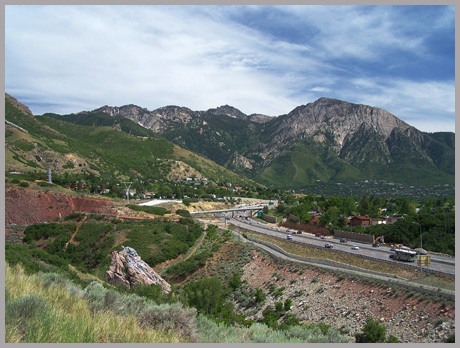 Following Avenue 3300 in Salt Lake City south to its western end may be the most convenient way to get onto I80 to Parley's Summit. Shortly before the freeway entrance a large REI store as well as a host of other shops provide a chance to stock up on brake shoes, or whatever else has been broken or depleted on the ride sofar ( in my case it was a pair of cleats ). Unlike other bike stores in the area it is also open on Sundays. When coming from the mouth of Mill Creek Canyon, bicycle traffic is funneled away from Parley's Canyon to Parley's Crossing. This interesting bike path construction does not exactly make it easy to get onto I80, but it is possible. I took the first picture while looking for the way. The initial part of I80 leads along exits leading to blocked off roads or quarries. It's a long gradual grunt through desert hills that have been rechristened into "mountain dells" by real estate developers. No alpine peaks or incised canyons are visible on this route. The closest thing to a scenic experience is the exit leading to the low point between Little Mountain Pass and Big Mountain Pass ( second picture ). The top has long been populated by suburban type homes, a gas station and strip malls, interspersed with the occasional mormon temple mega complex. There is also a mountain park and an elevation sign. From East. (described downwards). Signs warning of a downhill ahead make the cyclist feel hopeful. But in reality it is quite short and straight on this side. In the past it lead past signs advertising full ownership in leftover olympic housing complex units, turned condo, for a mere 500 000 dollars. Sorry - all sold out. A frontage road runs along the south side. But it is safer to stay on the interstate, since the busy business route has no shoulder. Much of the suburban commuter traffic along the route takes a right along another traffic monster to Park City. Continuing along I80, the mountains behind Park City look less dramatic from this side, seen between a sea of developing suburbia. With a strong west wind it's a fleeting impressing that floats by quickly, almost as if seen from behind the protecting wind shield of a speeding car. More often the wind blows in the other direction, and the ride can be less pleasant at the end of the day in rushhour traffic. 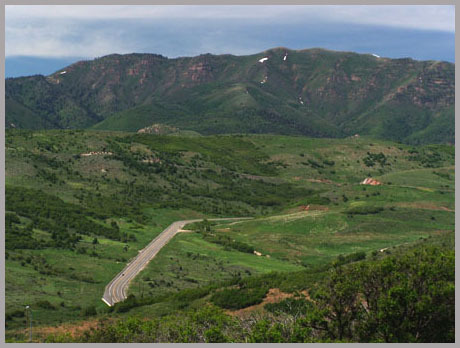 (single track+unpaved+paved): A loop ride from Silver Crossing ( junction Ut248 - US40 ) to Park City, up to Guardsman Pass, over the the Wasatch Crest Trail summit(u) down Mill Creek Canyon, returning via I80 and Parley's summit measured 64 miles with apr. 6400ft of climbing in 7:1 hours, using a VDO MC1.0 cycle computer (m3:07.06.11). The Overland Trail ( < North Ogden Pass | Daniel's Summit > ) In 1849 and 1850 Howard Stansbury mapped passes to the east of the Great Salt Lake, while looking for a better supply route between the Oregon Trail and Utah. During that time Parley's Summit was known as Golden Pass, named for the high toll road prices charged by Parley P Pratt, the mormon leader and owner of the toll road over the pass. By 1850 Stansbury had become convinced that there was better route east from Salt Lake, than a direct connection with the Oregon Trail to the north. This later became the Overland Route, and replaced part of the Oregon Trail. He started to explore this route with his guide Jim Bridger as he left Utah over Parlely's Summit. But he recommended Provo Canyon (leading to Silver Summit) as best route for this. After that the route continued over Strawberry Pass, today more commonly called Daniel's Summit.